Bosa Properties and Henriquez Partners Architects are poised to transform 1575 West Georgia Street into an urban cornerstone with a dual-tower residential building perched atop a four-storey podium, offering retail at grade and three floors of office space over seven levels of underground parking. 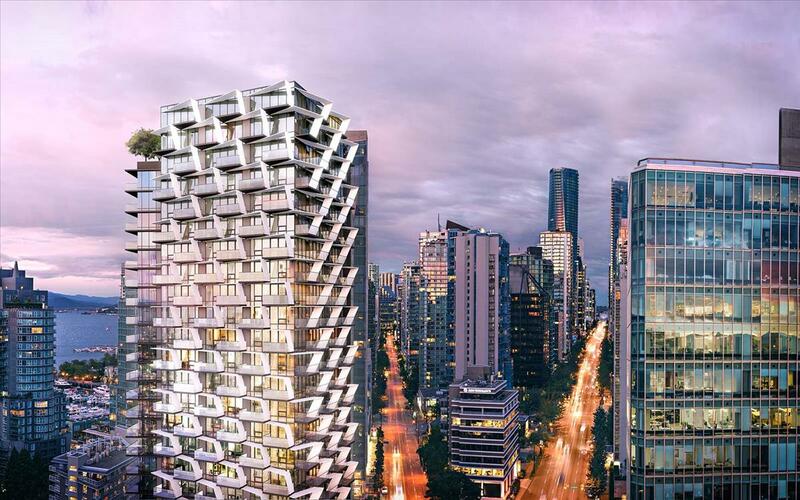 This boutique collection of luxury residences raises the bar for architecture and innovative design in Vancouver. Anchoring the corner of Georgia and Cardero streets, a distinctive 26-storey tower is fitted with special screens to reduce solar heat gain while providing residents with greater privacy and shade. On the property’s Pender Street facing, a 21-storey tower alternatively reflects the residential character of its eastern neighbors. As a Cardero homeowner, you’ll be ideally situated near the Coal Harbour waterfront and its multi-purpose seawall, connecting the convention centre and cruise ship terminal at Canada Place with Stanley Park, considered North America’s most outstanding urban park. Walking, jogging, cycling, roller blading, swimming, kayaking, sail boarding, rowing – all are just steps from your front door. For hikers, skiers, and snowboarders, the North Shore mountains are a short drive over the Lions Gate bridge. Worked up an appetite? Sate your hunger at the multitude of multi-ethnic cafes and eateries nearby along Robson and Denman streets. When you’re here, you’ve arrived.